PACE Center for Girls Broward Presents Ginger Martin with 2015 "Honor the Female Spirit" Award. 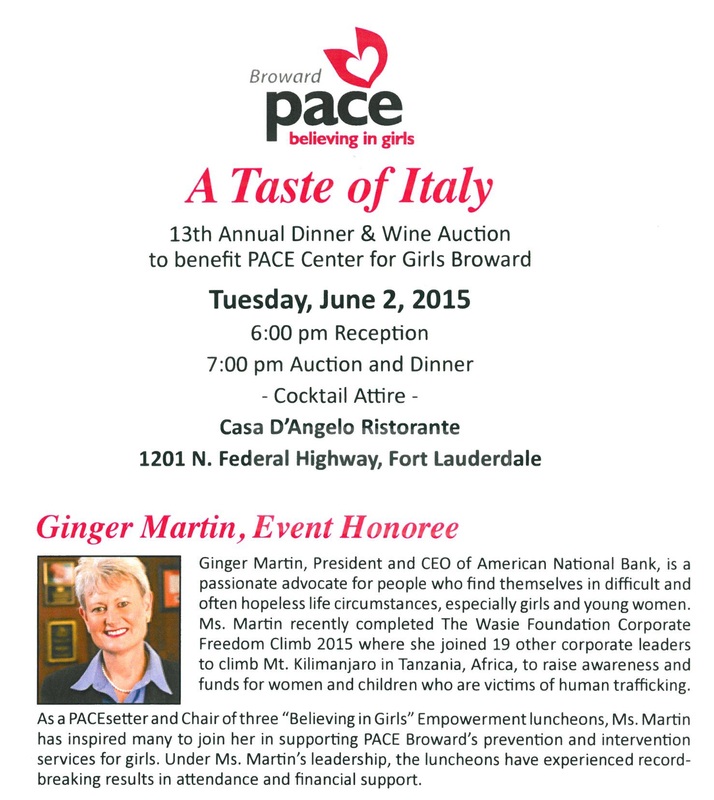 This evening, Ginger Martin, President & CEO of American National Bank will be presented with the 2015 “Honor the Female Spirit” award at the 13th Annual Dinner & Wine Auction to benefit the PACE Center for Girls Broward. Here at American National Bank, we are proud of Ginger’s commitment and her devotion as a PACEsetter, to continue to encourage support of PACE Broward’s programs. This entry was posted on Tuesday, June 2nd, 2015 at 8:24 pm and is filed under Uncategorized. You can follow any responses to this entry through the RSS 2.0 feed. You can leave a response, or trackback from your own site.